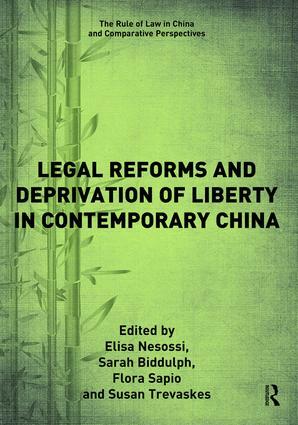 The volume presents an extensive investigation into the process of reforms of detention powers in today’s China and offers an in-depth analysis of the debates surrounding the reformist attempts. The chapters in this collection demonstrate that legislative and institutional reforms in this area result from political opportunities - openings and tensions at the central institutional levels of political authority - and contingent social and political factors. The book examines legal and institutional reforms to institutions of detention and imprisonment that have occurred since the 1990s, with a particular focus on the 21st century. Its content follows three particular lines of enquiry concerning the issue of deprivation of liberty in contemporary China. The first deals with the academic and theoretical debates on the subject of imprisonment and detention. The related chapters explain the difficulties encountered in this area of research and understandings of the discourses of reform through labour in Western and Chinese scholarship. The second deals with the specific issues of criminal and administrative forms of deprivation of liberty, examining in particular the institutional and legislative dimensions, considering the relationship between reforms and criminal justice policy agendas. The third assesses the meaning of institutional reforms in the context of the changing state-society relationship in contemporary China. Contents: Preface; Deprivation of liberty under scrutiny, Elisa Nesossi, Sarah Biddulph, Flora Sapio and Susan Trevaskes. Part I Administrative Detention: What to make of the abolition of re-education through labour?, Sarah Biddulph; China’s socialization of administrative offenders in the community: an unrealistic agenda?, Enshen Li; Deprivation of liberty against one’s will in mental health institutions in contemporary China, Zhiyuan Guo. Part II Criminal Justice Reforms and Deprivation of Liberty: Residential surveillance: evolution of a Janus-faced measure, Joshua Rosenzweig; China’s pre-trial detention centres: challenges and opportunities for reform, Cheng Lei and Elisa Nesossi; Addressing the ‘hide and seek’ scandal: restoring the legitimacy of kanshousuo, Nicola Macbean. Part III An Assessment of the Field: Framing imprisonment studies in China: ideology, law and politics, Elisa Nesossi and Susan Trevaskes; Western analyses of deprivation of liberty in China, Flora Sapio; Opportunities and challenges for legislative and institutional reform of detention in China, Elisa Nesossi, Sarah Biddulph, Flora Sapio and Susan Trevaskes. Index. Elisa Nesossi is an Australian Research Council Research Fellow at the Australian Centre on China in the World, Australian National University. Her research interests include Chinese law and institutions, comparative criminal justice and human rights law. Flora Sapio is an associate at the Australian Centre on China in the World at the Australian National University. She has published on Chinese criminal law, criminal justice, legal philosophy in China and the Chinese Communist Party regulatory system. Susan Trevaskes is a professor and member of the Griffith Criminology Institute at Griffith University and an Adjunct Director of the Centre on China in the World at the Australian National University. Her main research interests include the death penalty, policing, drug crime, public shaming events and justice system reform in China. There is no doctrine more effective than the rule of law in portraying the complex transformation of Chinese society from the rule of men towards the rule of law - a process inaugurated in post-Mao China which is continuing to advance legal reforms to the present day. In other parts of the world, striving for the rule of law is also evident: countries in transition face a similar mission, while the developed democratic countries are forced to tackle new challenges in retaining the high benchmark of the rule of law that has been established. Research on the legal system in China and in comparison with other countries in the framework of the rule of law covers broad topics of public and private law, substantive law and procedural law, citizens’ rights and law enforcement by courts. Based on this broad understanding of the rule of law, the series presents international scholarly work on modern Chinese law including: comparative perspectives, interdisciplinary, and empirical studies.